Royal Manchester Institution, the 53rd Exhibition, Manchester, 1873. Raffaello Sorbi was born in Florence and trained at that city’s Accademia di Belle Arti, studying with the academic master Antonio Ciseri (1821-1891) from whom he learned a very polished manner suitable to the grand history paintings he produced in his early years and which from the age of seventeen were quite successful. 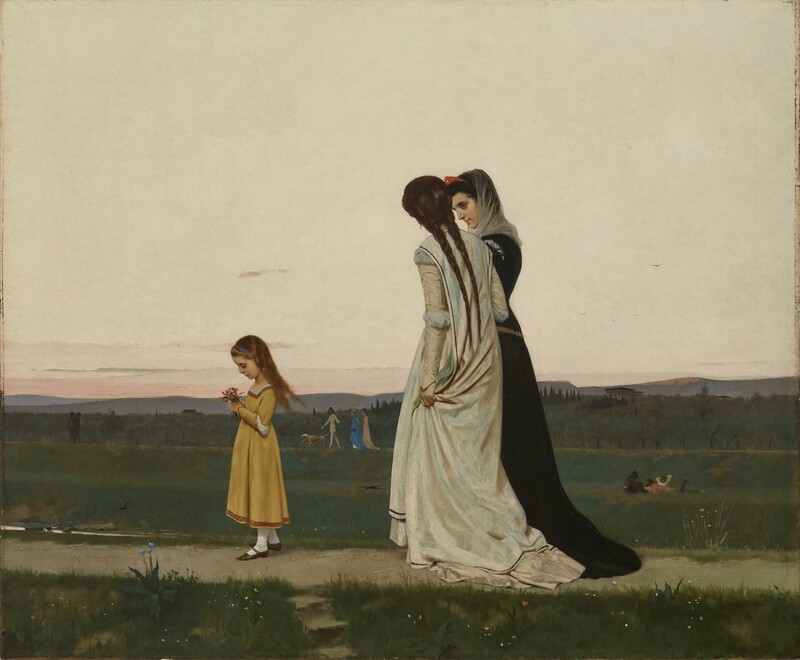 Beginning in the mid-1860s and influenced undoubtedly by the movement of the Italian group of painters from Florence and Naples known as the Macchiaioli, who were active from the 1850s and rejected the academic approach, favoring instead bright and often sketchy scenes of everyday life, Sorbi also turned to smaller scale works of various genre. Then in 1872 the French dealer, Eugène Goupil, made an exclusive agreement with Sorbi to acquire almost all of his production. This gave the artist access to markets in Paris, London, and New York, and he never really had to worry thereafter about sales. He was appointed an academician at the Florence Royal Institute of Fine Arts. In 1923 he gave his Self-Portrait (fig. 1) to the Galleria degli Uffizi, and in 1927 he participated in the Esposizione Nazionale at the Palazzo Pitti. In 1931 several months before his death, Sorbi received the Order of Commendatore della Corona d’Italia. His son also became a painter. another of the “fourteenth-century paintings” dated 1874 (fig. 8). Beginning just at the time of this painting what has been characterized as “Later Tuscan Realism” saw the Italian painters of the Florentine school and Macchiaioli, like Silvestro Lega (1826-1895), who was also a former Ciseri student, turning to refined, vast landscapes without limits that employed dramatic color and light contrasts in depictions of the countryside (figs. 9a-c). Sorbi too was attuned to this approach, as evident in a number of his works (figs. 10a- c). In the present painting the child leading the procession-like strollers may be intended to provide a wistful note of contemplation on the process of aging. The two main figures, deep in conversation and in contrasting dress of black and white, make their way along a path in a wide green field. Other strollers can be seen in the distance, which culminates in a low range of hills, suggesting, as the title gives it, “the environs of Florence,” perhaps in the direction of Fiesole. The setting sun reflected in the wispy clouds and the broad expanse of sky with the diffused light suggests evening is approaching, and the mood is definitely nostalgic and elegiac.